Sometimes I like to do a quick crochet project, something that works up quickly and satisfies my need to feel like I have accomplished something. Don't get me wrong, I am perfectly happy to settle in for the long haul and really sink my teeth and hook into something - like my Garden Patch Granny Afghan which I am still working on - but I do find it nice to intersperse smaller projects along the way. The hearts themselves were very simple to make. If you know how to increase in single crochet, you can work these up in no time. The pattern for the hearts can be found here if you want to give it a go: just make two identical hearts, single crochet them together leaving an opening on one of the straight sides, stuff the hearts through the opening, and then continue with single crochet to close the hole. For my hearts I used Lily Cotton - just rummaged through my yarn bin to see what I could find - and a 3.5 mm hook so that the stitches would be good and tight, and none of the stuffing would peek out. While the plain hearts looked okay - and I am thinking of making a few plain red ones for Valentine's Day - I decided to fancy these up a bit by adding some flowers and leaves to the front. It was incredibly time consuming to sew on the flower and leaf details, but the results are quite pretty and I do really like them. If you want to hang your hearts up you will need to make a hanger; mine was a simple crochet chain, about 35 stitches long. 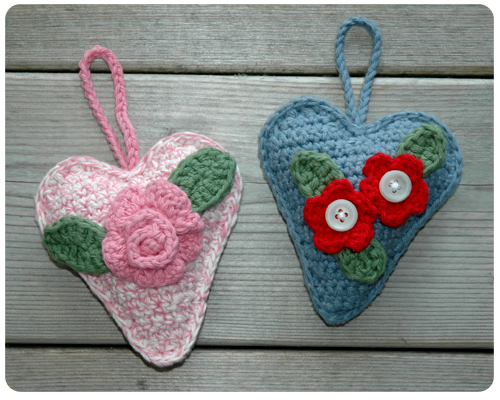 Another thing to note: if you do decide to put flowers and leaves and/or a hanger on your hearts, you'll need to sew everything in place on the front heart before you sew your two hearts together. Well that is all I can think to tell you about this little project that has been occupying my hook. 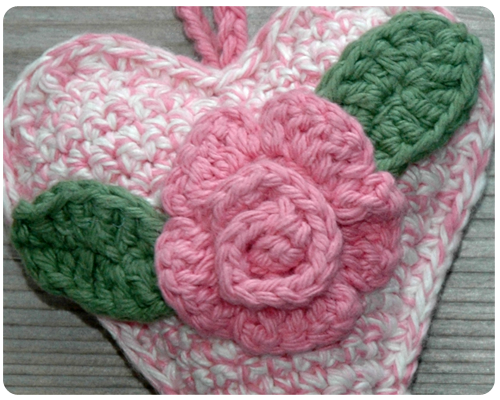 I did enjoy making these hearts as they are very simple, pretty, and portable. 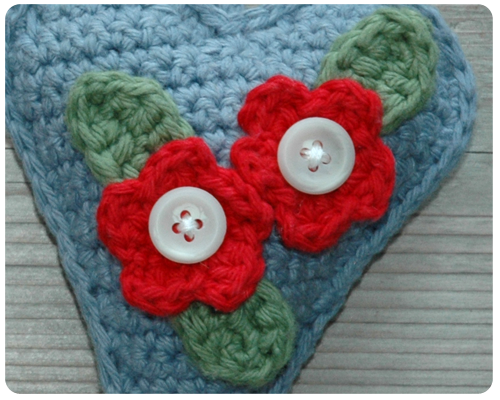 Give them a go if you wish, try different colors of yarn and different embellishments on the front. Have fun!